Yes, I know I was supposed to stay away but hey I'm only human. I also happened to pick up my mail at my box today and got a lovely surprise package that I will be sharing with you. Raise your hand if you love free books? I thought so. Me too. I love getting them and specially when they're unexpected. I sat down and flipped through two great ones this afternoon, enjoyed them a bit and now I'm ready to let them go - kind of. We literally have no space in our bookcase for more books and I'm determined not keep anything we can't put in the right place. As a matter of fact, I'm getting a serious "spring" cleaning bug. The type that has me clearing out closets (drastically) and taking tons of stuff to Goodwill. I know this is going to sound strange but I'll share anyway. When I'm in the middle of purging, I repeat a short phrase to myself (out loud mind you) when I'm undecided about getting rid of something: "Be BRUTAL!" Nine times out of ten I end up getting rid of whatever it was that I was doubtful about. It really works. Try it. But I digress. On to the book giveaway. Over and Over by Mike Perry - This book is particularly painful to let go. It's all about hand drawn patterns. Very, very cool! Forecast by Nicholas Blechman - This book offers a lot of food for thought and is very visual too. So here's the deal. I need a little help deciding something and I'd really love your input. Please! So... to enter the contest please answer a little question I have. If you've read my blog before you know about a small (emphasis on small) collection of patterns that I've been working on) so I've been toying with an idea for a while. Coincidentally it was also mentioned in the Spoonflower blog. If I sell the rights to my patterns to be used/uploaded for Spoonflower fabric would you consider that a good idea? Any pros/cons comments or other ideas are also welcome. I can think of a million reasons why it isn't a good idea but I can also think of other good reasons as well. I'm really torn. Easy. Right? Thank you in advance for your input. I love that giveaways pull some of you out of lurking. And I love meeting new people, so please join in the fun and introduce yourselves. Everyone is sooo nice here. Really. I will select two winners on Monday, September 1st. Yes, it's a holiday but we're not going anywhere. Good luck and thank you to all of those that visit every day. By the way, thank you so much to those of you that made comments on my horrible bag post. I still cringe every time I see that photo. You're all too nice. Thanks! EDIT - Just to clarify something that came up in the comments section. Spoonflower is not offering to sell the rights of any patterns. They will allow people to sell their own designs in the future but as of right now it would be something that I'd be doing on my own end. My customers would purchase a file for a fee from me and use it to upload it at Spoonflower. Sorry for the confusion. free books are the best books; i think it depends on whether you have future plans to design fabric and sell it yourself. if you do, i'd keep the patterns, but if it's just something you like to try/do for fun, i say go for it! do you feel like you have more patterns in you? it might be a good way to get started with that. 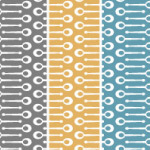 how about choosing two patterns for spoonflower and seeing how it goes? HUmmm I am the 3rd! Humm maybe... I was actually at Barnes & Nobles 'yesterday' flipping through Over & Over and I decided to look for on Amazon ( for a better price ) instead of reacting to my impulse of buying one more book -since I have so many already! Anyway, my hand IS raised!!! I'd love the books, of course. If selling the rights to Spoonflower would make it easier for me to buy, then I selfishly vote yes. I love the books -- my opinion about Spoonflower is to let your patterns go with credit and cash in your pocket. You are a creative individual and there are certainly more great patterns in your head. You got the lurker out! I'm Jessica and I'm a graphic designer in Missouri and I love your nuance and how you blend graphics, patterns, logotype and textile. You're a great inspiration fro my work place. As far as selling your patterns' rights, I think it all depends how you feel about the patterns in question and your work as a whole. Some people go their whole lives without ever diversifying to the point of expansion, just doing what they do as a hobby. I would say that if you feel that its a good idea to sell THESE patterns then do so. You've got great ideas, and whatever happens it doesn't determine the outcome of the rest of your career. You could sell these, and depending on the outcome never sell another one. But it's worth trying once I think. I agree with Azúcar - I really love this pattern and can see it being quite popular (I want the grey and yellow badly) -- that being said, I can see it being quite popular so you might want to keep it for yourself! The lawyer in me wants to know the terms of the licensing agreement. Those patterns are desperately awesome, and I'm hesitant for you to relinquish the rights for a song and a dance. Let's face it, Spoonflower isn't asking everyone to keep and sell their patterns. They know when something is good. Is fabric design something you can see yourself doing? Regardless of how many good designs you have in your head, it might make sense for the long term to keep them all together under the same brand/label. my opinion? i say sell (for a good price, of course)! you are an artist and have many, many, many more patterns where that came from. hope that made sense and helped a little! good luck, whatever your decision! Great giveaway!! would love to win the books !! I agree with many of the above comments..I think you should sell your patterns for a good price..as its a new venture there is no harm in trying..& you would never know the outcome of it till you've tried !! go for it. why not try and see how it goes? consider it a test pattern (no pun intended). in my humble opinion... if you can still say "hey- i designed this for spoonflower" (even if they don't claim you as the real designer) to future clients or friends and family, i say go for it. i would think you would have more patterns in you, so why not sell the rights to a few to give you the collateral to build yourself up even more? it would be a great "resume" addition and it gives you bragging rights. I'm still enjoying the one I won from my give-away here. I've been savouring it because I was reading three other books as well and since it's a collection of essays it's easy to read one or two and put it down. It's so good and fun and juicy (and a little naughty even because she's so honest) but I'm loving it. I don't want it to end. I wish I could give you sound advice about the pattern. Others have brought up good points. A lot to think about. My first thought is it's business and running a business means making a profit. I want to believe they are fair and hope that they are in negotiating product design rights. Go with your gut. I'm not saying don't think through all of the details but I know we have a gut feeling and more often than not we don't really listen to it. It might be a great opportunity for you and of course it's always a risk but we never move forward without taking risks. Think first of yourself. No offense to Spoonflower but they aren't thinking of you first. They have to watch out for themselves first. It's a business opportunity. You have to do that too. Think of your direction, your goals and how it will help you. i think you should definitely give the rights to spoonflower. your fabric is really cute! Just something to think about while purging your things, besides goodwill (which is a great organization) there are many other non-profit organizations that most people don't realize take donations. One place that I donate to is called SARA which is Shelter Animal Resource Alliance. They have a thrift store and all proceeds go to rescuing, assisting and advocating for animals. Hi! I'm delurking since you urged me to! & because I love free stuff, too! I think you should sell the patterns if it's not something you love, love, love. It might lead to more opportunities for you. & even if it doesn't, it might drive you to think up more new patterns. What fun books! I think you should try the selling to Spoonflower. It would give you a better idea about how much people are willing to pay for your patterns. You could then use tht to base other the sale of upcoming patterns to others. I want to win Over & Over. As far as selling your pattern, I say do it. It's already out there and sadly people will copy it. You might as well make a little change. Would you believe me if I said I was delurking just to help out? Really, I am! I agree with Cicada. Is it out of the question to pay the upfront cost of having your (lovely) designs printed up yourself and then selling your wares? That's basically the same idea -- YOUR stuff will still be out there inspiring the masses -- but this way you retain rights and you make majority of the profit. Here's a thought from my perspective and that's that of a bagmaker: I'm constantly on the lookout for awesome fabric and most of the time it's for fabric that is, start to finish, put together by someone indie like myself and most of the time, it's through Etsy. Not that I don't love some of the fabric lines out there because I certainly do but it feels so much cooler supporting someone who I feel is more like me in terms of trying to carve out a business. What I'm saying is that personally, I dig your fabric and I'd be much more likely to buy it as yardage from you than I would to purchase a file to have it printed myself. As Cicada said, that's absolutely not a slight to your designs -- on the contrary, as I love love LOVE them, but just a point to say that I think you'd probably make quite a bit more of a profit if you took your own designs to Spoonflower yourself. Um, did any of that make sense :)? I assume you would like to make money from your pattern? Who wouldn't? I'm not very experienced in these matters but is it a matter of selling the file or a piece of fabric? If you sell the file I assume someone can print as much as they like, and you get just the one-off payment. If you sell the fabric then you get $$ per meter but have to take a gamble on how much to print. Again I'm not very knowledgable on fabric printing matters, but selling the file seems less of a gamble but potentially less of a money spinner too. So there's my 5 cents. I really think you should sell those pattern somwhere else. Spoonflower will be good, but it will be a one-time money spinner. Also, if you choose some company which put patterns on , say, houseware, paper and fabrics..you get more mileage. The way that you clarified it sounds like it might be a good thing for you as a launching point. You're not losing the rights to your designs but perhaps gaining some exposure through your connection to Spoonflower and maybe then it will branch off into bigger and better marketing possibilities. I'm with Michelle from Cicada Studio, mainly b/c I'm in the business of designing/selling fabric as well. I like the idea of your willingness to offer your design for use by others wishing to have it printed - I've thought of this as well. However, I don't believe you should hand over a TIFF file to just anyone and let them have it with SF. In all likelihood, you'll want the buyer to produce an end-product that reflects well back on you (since I'm sure they'll label their product "designs by A Little Hut"), but what happens when the fabric doesn't look good b/c the colors are off-tint or some such thing? Then, your design work is viewed as completely mucky and inconsistent, etc, etc. Not a chance I'd want to take, having come so far already. I would suggest offering your designs for sale, printing on demand, even changing colorways for them if desired - but you do everything and simply give them the end product they want. No loss on color control, design control - consistency and professional integrity maintained. Can't wait to see what you decide!! i think you should go for it. i always like moving on from projects - even those i love and am extremely attached to - because it somehow seems to free up my mind for new ideas to creep in. who knows - the next thing you create could be your greatest yet! I am a huge fan of the pro/con list. Ultimately, you will know what is best for you to do. Just from reading your blog almost daily, I don't think you will like giving up control of your design. I think it will seem less yours that way. WOW!! Thank you so much everyone for your great comments and ideas. You've helped me more than you know. To clarify again (I edited the original post as well): My idea has nothing to do with any new service Spoonflower is offering. It is something I would do from my end. A customer would purchase the rights to reproduce one of my designs through Spoonflower and SF would only produce the fabric. There would be no contract with SF at all. As far as I what I've decided to do... I'm still unsure on how to proceed with this fabric/pattern idea simply because I'm so new to this. What I do know for certain (after the food for thought you gave me with your comments) is that I will only be selling fabric directly through my shop or through a second party fabric shop, if I get that far (probably way down the road). Yes, I agree with many of you. There are instances where jumping right in and going for it is appropriate. I've done it on other occasions. In this case, my concerns over maintaining the quality and standards of my work are greater than my desire to get my name 'out there' or to earn some quick money. I guess I just really needed to hear some feedback to really cement and sort out my thoughts on the subject. Like I said before, your comments really helped me. Basically, I have more research to do. I will continue to work on my pattern collection and will seriously look into how to get the fabric produced. I will definitely keep you posted and thanks again for all your help! You've been great! Hmm, I have no experience with this, but I say give it a try. If customers can only go through you, you have the option to stop selling whenever you decide. As far as the pattern goes, I'm a designer/illustrator myself and know how hard it can be to relinquish rights of something! I think the way I would go would be to order a small quantity and try to sell it myself, and see how that goes. However, you might have more exposure by going with the spoonflower option. If you are in control of selling, then I think either option could be good. It just depends on what your goals are. So, you would keep the original ownership, right? You're just selling reproduction rights for people to print their own fabric? And they wouldn't be able to sell that fabric, right? It sounds alot like what you do with your calendar templates. So I guess I'd say go for it. If it's different than that, if you would be selling your copyright, then I would say don't. I think it would be a great idea to sell your designs, I really wonder how this Spoonflower is going to change things, as it gets more popular! It is exciting, I think! Oh, and free books, please enter me in the give-away! I can't resist the lure of free books, especially Over & Over! I keep finding that you and I somehow sink up on ideas...for the past couple of months I've been researching the world of fabric design and turning that work into usable goods. So I have a fair idea of the colors I'd like to see together in a collection of fabric patterns :) For neutrals I'd use white and a warm grey. Then my accent colors would be lime green and a medium to light blue. Looking forward to seeing your future adventures in the world of fabric design and perhaps sharing some of my own with you! Wishing you the best in your future endeavours! I love your fabric design. It's elegant and very modern. I like your idea of researching your options further. For example, what might your options be for selling your fabric designs and having them produced through one of the designer fabric lines, ala Anna Maria Horner? She seems to have a lot of creative control over the finished product, though I'm sure that's not always the case. I can't wait for YOUR book to come out! Hope the writing is going well.